A musician since the age of 10, David Hearn started his first band in 1980 with his good friend Henry "Skip" Flower. Later bands included Infinity, Matrix, Wax, The Orion Syndrome, and Orion Starbirth. As David's major influences are members of Pink Floyd, The Who, Rush, and the Moody Blues, he tends to write progressive rock; guitar & synth oriented material. The music can range from dark, brooding opuses to uplifting & hopeful pop tunes. The Moodies influence and the Pink Floyd influence are in constant battle! Mixing his interest in space & astronomy with the progressive and classic rockers of the 70s & 80s, David has created complex space music which has been described as "105% Triumphant". With several Top 10 hits on the banner music site, MP3.Com, David's music is an essential part of any classic rock lover's playlist. NEW ALBUM!! 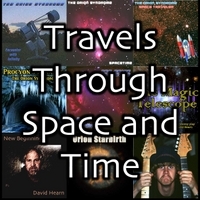 "Journeys through Space and Time" now available on CD Baby! The Magic Telescope was an astronomy play to be distributed on DVD, as an astronomy outreach offering. Although the DVD never made it to market due to legal issues, the music from the play is available here. New Beginnings is an emotional view of a transition in life, encroachment on middle age, and recovery to a state of happiness.